This work explores Edith Wharton's career-long concern with a 19th-century visual culture that limited female artistic agency and expression. Wharton repeatedly invoked the visual arts - especially painting - as a medium for revealing the ways that women's bodies have been represented (as passive, sexualized, infantalized, sickly, dead). Wellversed in the Italian masters, Wharton made special use of the art of the Pre-Raphaelite Brotherhood, particularly its penchant for producing not portraits of individual women but instead icons onto whose bodies male desire is superimposed. Emily Orlando contends that while Wharton's early work presents women enshrined by men through art, the middle and later fiction shifts the seat of power to women. From Lily Bart in "The House of Mirth" to Undine Spragg in "The Custom of the Country" and Ellen Olenska in "The Age of Innocence", women evolve from victims to vital agents, securing for themselves a more empowering and satisfying relationship to art and to their own identities. Orlando also studies the lesser-known short stories and novels, revealing Wharton's re-workings of texts by Browning, Poe, Balzac, George Eliot, Sir Joshua Reynolds, and, most significantly, Dante Gabriel Rossetti. "Edith Wharton and the Visual Arts" is the first extended study to examine the presence in Wharton's fiction of the Pre-Raphaelite poetry and painting of Rossetti and his muses, notably Elizabeth Siddall and Jane Morris. Wharton emerges as one of American literature's most gifted inter-textual realists, providing a vivid lens through which to view issues of power, resistance, and social change as they surface in American literature and culture. "In this meticulously researched study of Wharton's novels and short stories, Orlando (Fairfield University) makes a convincing argument for the ways in which Wharton enacted, through her work, a 'cultural critique that transcends the literary arts.' 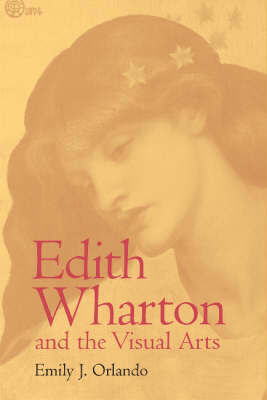 Interweaving illustrations of 19th- and early-20th-century art and detailed close readings of Wharton's fiction, the author guides the reader through Wharton's critique of the pre-Raphaelite artists and their vexed representations of women. Thanks to Orlando's impressive knowledge of art history and of Wharton scholarship, this volume secures an understanding of Wharton's place as one of 'American literature's most gifted inter-textual realists.' Nor does Orlando sacrifice depth for breadth. So smart and commanding a reader is she that the study's multidisciplinary approach (art history, cultural history, women's studies, US literature, Victorian literature) only enhances its appeal. One leaves this book with a more thorough understanding of Wharton's engagement with the visual arts as well as deeper insight into her complex, often-misunderstood relationship to the representation of women and the emerging feminism of her day. A distinguished contribution to Wharton scholarship. Summing Up: Essential. Upper-division undergraduates through faculty."